Clark International Airport won in the recent Asia Heats of this year's Routes Airport Marketing Awards. Clark won the under 20 million passengers category. Nigel Mayes, vice president Commercial of Routes said over the past 12 months Changi has achieved some amazing results. Susan Willis, marketing and analysis manager at UBM Aviation Routes, said Clark was chosen by judges for its “effective growth” in 2012. “Your airport was voted for by the airline community together with a panel of industry experts drawn from the airline networking planning community where they considered your marketing services and effective growth over the last 12 months,” Willis said. Clark International Airport Corporation President Victor Jose Luciano attributed the award to the “phenomenal performance” of the airport in terms of growth in passenger traffic and aircraft movement last year. “Clark Airport had yet another banner year in 2012 posting an unprecedented 72 percent growth in passenger traffic, 69 percent increase in air traffic movements, and 44 percent increase in airport revenues” he said. “Despite another challenging year for the global aviation industry, Clark Airport continued its march as one of the region’s fastest growing airports during the past four years,” Luciano added. Clark emerged as the winner among six major airports in Asia, namely, Aukland International Airport in Mangere, New Zealand; Bengaluru International Airport in Devanahalli, Kamataka, India; Rajiv Gandhi International Airport in Shamshabad, Hyderabad, Andrha Pradesh, India; Juanda-Surabaya International Airport in Sidoarjo, Indonesia; Kansai International Airport in Osaka, Japan; and Siem Reap International Airport in Siem Reap, Cambodia. Low-cost carriers which fly out of Clark are Air Asia, PAL Express, SEAIR, Tiger Airways, Cebu Pacific, Zest Air and JinAir and legacy carriers Asiana Airlines, Dragonair, Cathay Pacific and the latest addition, Emirates. Clark has 60 domestic flights per week. Air Asia flies 7 times a week to Kalibo and thrice a week to Davao; PAL Express flies 4 times a week to Kalibo, 4 times in Cebu and thrice a week to Puerto Princesa; Cebu Pacific flies thrice a week to Cebu while Seair flies 4 times to Kalibo and Zest Air, twice a week to Kalibo. Clark is connected to the world as Dragon Air flies out of Clark to Hongkong; Cathay Pacific has routes from USA and Middle East to Hongkong such as Abu Dhabi, Bahrain, Dubai, Jeddah, Pakistan, Los Angeles, Francisco, Chicago, New York and Vancouver. Air Asia flies to Kuala Lumpur while routes from Australia to Kuala Lumpur include Sydney, Melbourne and Perth. Asiana flies to U.S.A and Australia to Incheon, Korea out of Clark. In 2012, Clark recorded 1.315 million domestic and international passengers surpassing the 767,109 passengers in 2011. 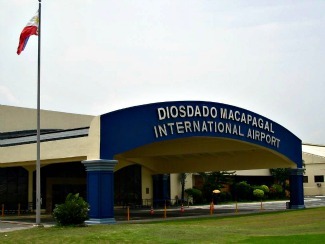 Airport revenues grew by 44 percent to P511 million in 2012. Luciano said 2013 promises to be an even bigger year for Clark Airport. “The start of the new year brought with it new optimism and higher expectations. After signing an agreement with Clark International Airport Corp. (CIAC) during the second week of February,” he said. Emirates announced that it has selected Clark as its second Philippine destination with daily direct flights from Dubai to Clark starting on October 1, 2013. “Indeed, the entry of one of the world’s largest and fastest growing airline with connectivity to 132 destinations worldwide shall further boost Clark’s position as the next major international gateway not only in the Philippines but in the Asia Pacific region,” Luciano explained. Emirates has an extensive global networks-- in Africa it has 22 destinations; Asia has 31 destination; Australasia, 34; Europe, 32; Americas 11; Middle East, 17.